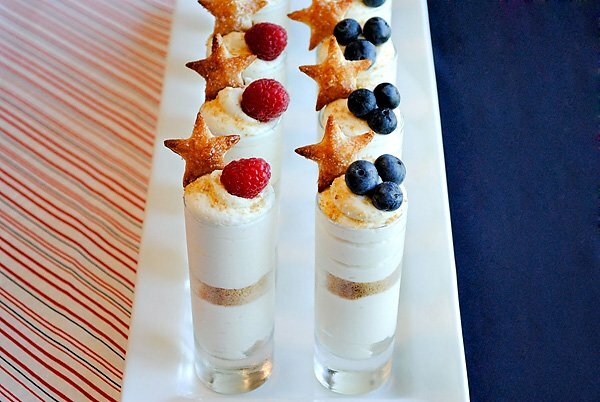 Are these Stars & Stripes Cheesecake Shots DARLING or what?! 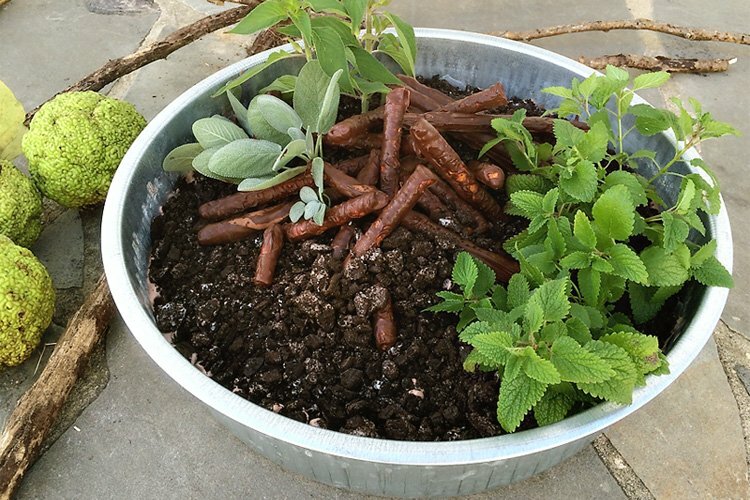 The super-talented Carrie of Half Baked was kind enough to share the full recipe and instructions with us today…just in time for 4th of July! Beat cream cheese, sugar and vanilla in large bowl with mixer until smooth. Gently stir in cool whip until well blended. 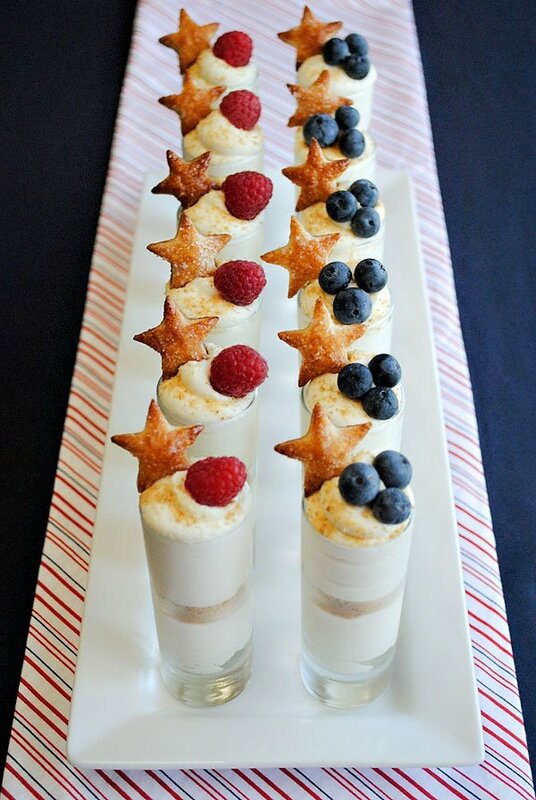 Fill individual glasses half way with cream cheese mixture, either using a spoon or a piping bag fitted with a large round tip for a more polished presentation. Top with 1 tsp graham cracker crumbs. 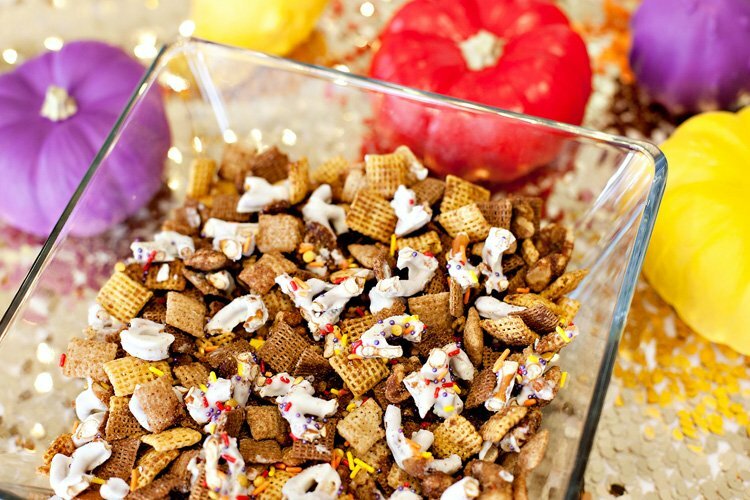 Shake glass to level crumbs. Fill to the top with more of the cream cheese mixture. 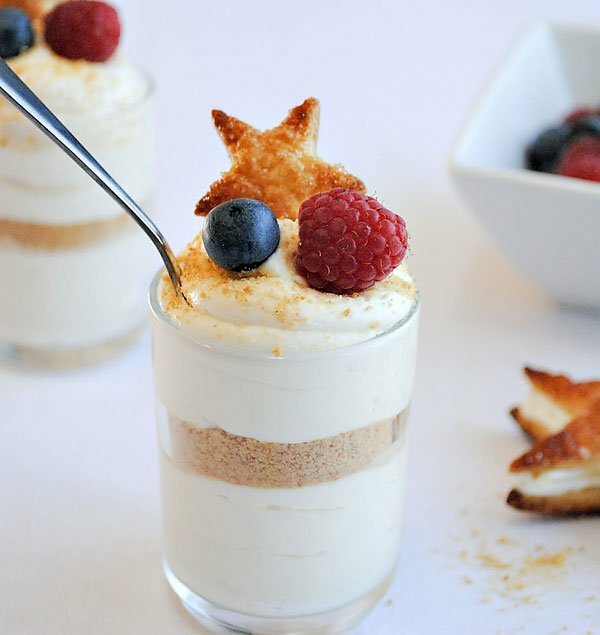 Lightly sprinkle with additional graham cracker crumbs and top with berries. 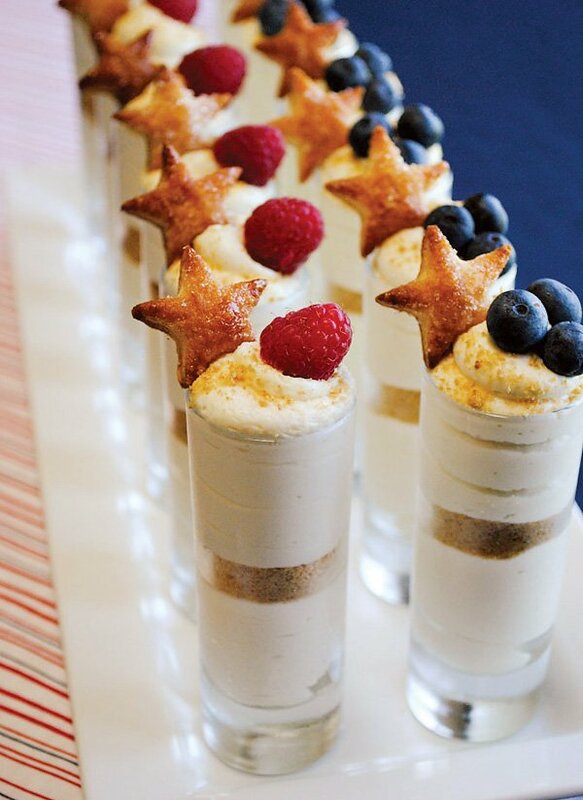 Add a star pastry for an extra fun little touch. Refrigerate 4 hours or until firm. Serve chilled. Makes roughly 16 mini servings, depending on the size of your shot glass. 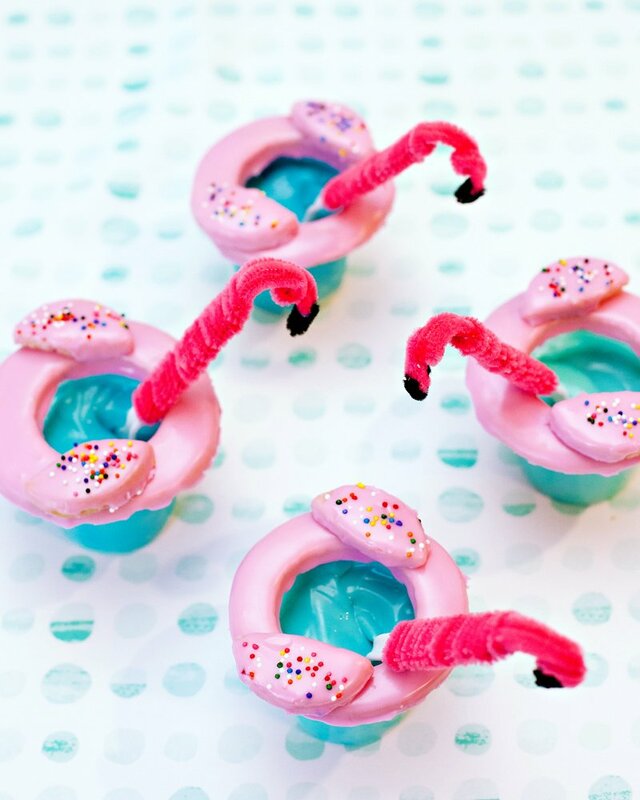 – Use a Ziploc bag to fill glasses if you don’t have a piping bag. Just fill it partially, seal and snip off one corner. Squeeze out! – Set out cream cheese ahead of time so that it is room temperature. This will help everything blend together and create a smooth consistency. 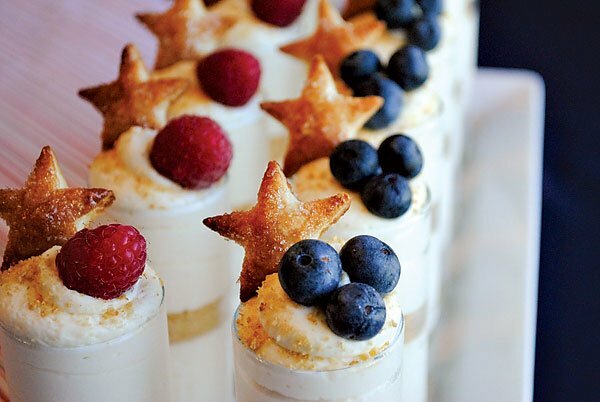 – Serve with a bowl of berries and additional Star Pastries for a patriotic display. Love it! 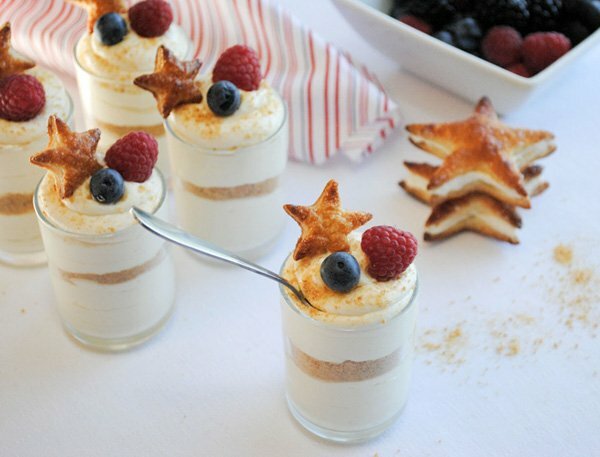 Does anyone know how to make those precious stars? Love this! Of course if you want to be totally lazy you could purchase the already made Cheesecake filling that Kraft Philly sells, LOL. Yay! Thanks for the feature Jenn! Such a fun way to start off my Friday! 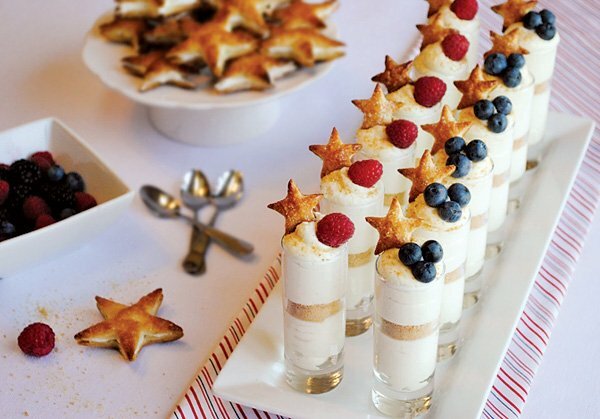 The recipe for the coordinating Patriotic Puff Pastry Stars is now up on Half Baked. Wishing everyone a safe and fun-filled 4th of July! Enjoy! These look so good Carrie! Thanks for sharing! Love her ideas!! Festive and fun!! Oehh this looks realy nice! you could always use a star shaped cookie cutter and cut shapes out of sugar dough… or any other kind of dough. These are wonderfully inviting little treats. Love them! Looks delicious! I must try this one. Thanks! 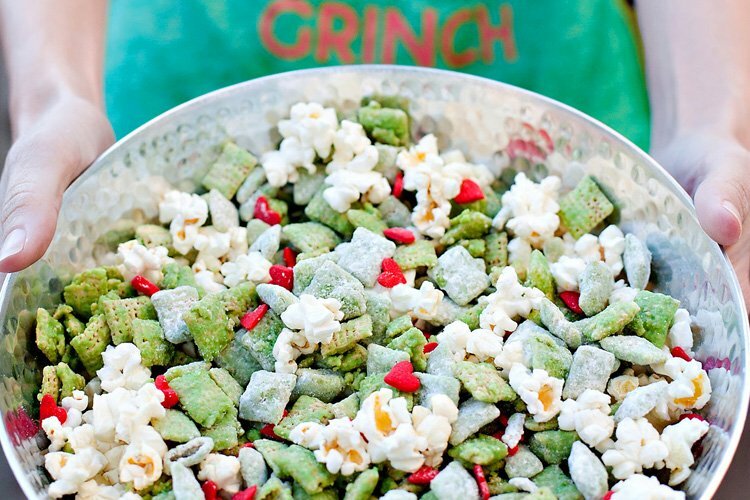 OMGoodness these look sooooo yummy & I’m excited to try this super simple recipe. Thanks for shairing. Oh my!! I Love these !!!! Thanks for sharing ! I have a party tomorrow night, could I make these tonight and let them refrigerate overnight until my party?